I don't really know what else to call it. It was an experiment that had pretty successful results so I wanted to put down the recipe. It's a spicy lemon/ginger/garlic broth with veggies and pasta. 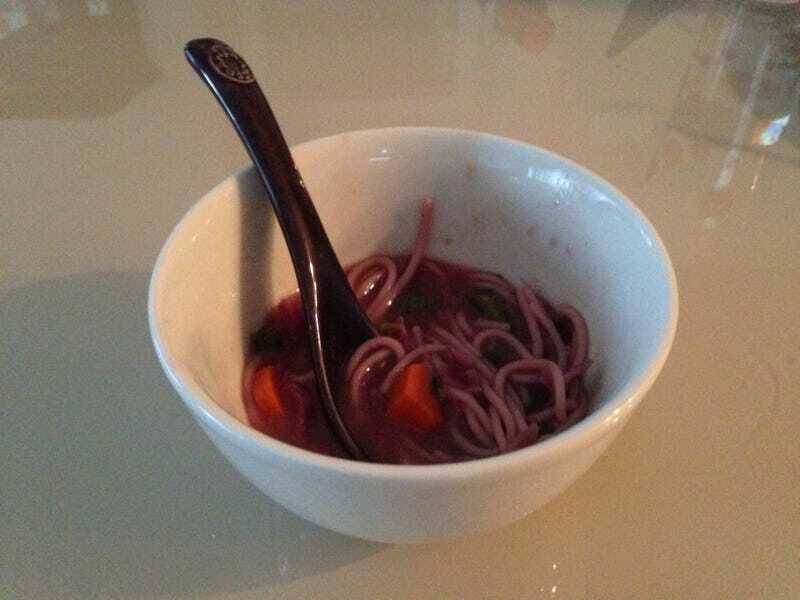 It's purple because the red cabbage turned the entire thing that color. I made it with vegan pasta because it was for somebody who decided they wanted to go down that rabbit hole; but feel free to use the good stuff, it won't make any difference to the cooking time. I'm gonna be screwing with the particulars for a bit to really dial it in, so if you want to make this just check back and make sure you're working from the current version. If you make it and improve it at all, let me know in the comments so I can try it and maybe make the recipe changes. Put the water and veggie broth in a pot over high heat and bring it to a boil, then back down to a simmer. Microplane the garlic and ginger, then add them in along with the lemon juice, salt, pepper, and sriracha. Let it simmer for about a half an hour or so while you prep the other ingredients. Take 2 thin slices off a head of cabbage and chop it down to a size where you can easily get a piece and a few other things into a bite. Peel and chop the carrots into 1/2-inch chunks. De-stem, wash, and chop the mushrooms up into small/medium-size pieces (I got about 8 pieces out of each head so aim for that). Wash the green beans, take the ends off, and chop the rest into about 3/4-inch pieces. Wash the green onions and, using scissors, cut them down so you have rings about 1/8-inch long. After the half hour of simmering, add in the cabbage. About five minutes later, add in the carrots and green beans. About five minutes after that, add the mushrooms; then the pasta, breaking it in half and adding it a little bit at a time and then stirring so that you don't have a giant clump of pasta. Cook until the carrots are softened and the pasta is ready (about 10 minutes), stirring occasionally and breaking up any clumps of pasta that have formed. When everything else has cooked, turn off the burner, add in the green onions and give the whole thing a final stir to get the onions evenly distributed. Let it cool off for a few minutes, and enjoy.